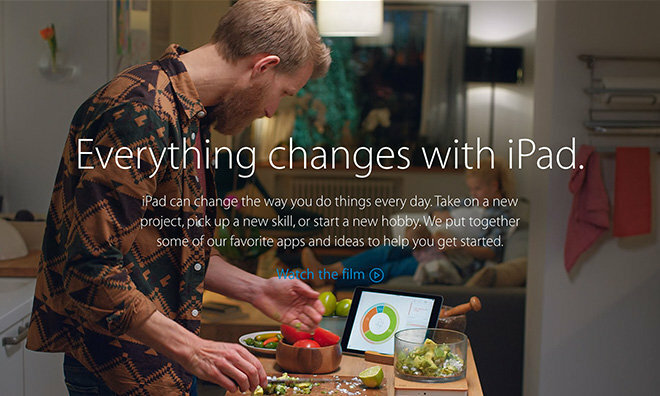 In a bid to reinvigorate waning iPad sales, Apple on Wednesday launched "Everything changes with iPad," a new ad campaign that offers a comprehensive look at how the tablet fits into and enriches the life of its user. Realized as a colorful mini-site on Apple.com, "Everything changes" serves as a portal to six categories —Cooking, Learning, Small Business, Traveling, Redecorating and a catchall "Why iPad" section —featuring third-party apps, and sometimes accessories, handpicked to help users complete a variety of tasks. Most sections read as primers to iPad capabilities and are largely designed to get new users started with their device, or entice those without to buy one. Instead of posting simple screenshots, Apple provides beautiful pictures showing users interacting with iPad, akin to the company's latest TV ads. For example, Learning shows children playing with apps like Metamorphabet and Tangram for Osmo, the latter being an accompanying app to a simple machine vision accessory. Each category spotlights about ten third-party apps across various genres. Interspersed throughout are examples of how Apple's own iOS apps, services and device accessories augment the ecosystem. Categories end with a link to a special Change Everything section in the App Store, which contains a list of apps advertised throughout the mini-site. While a dominant player in the tablet market, iPad is seeing sales wane in the midst of growing phablet devices like the iPhone 6 and market saturation. For its second fiscal quarter of 2015, Apple sold only 12.6 million iPads, a year-over-year decrease of 23 percent that marked the fifth consecutive quarter of contraction.